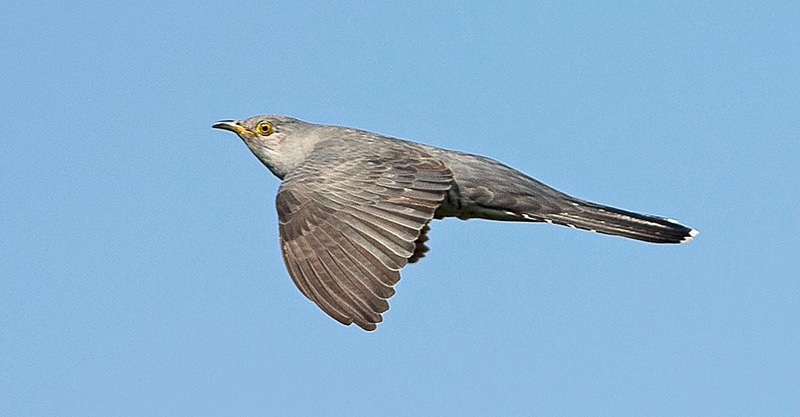 The Common cuckoo, or Eurasian cuckoo (Cuculus canorus Linnaeus, 1758), in Italian Cucùlo or Cùculo euroasiatico, being both accents accepted, belongs to the order of the Cuculiformes and to the family of the Cuculidae and is one of the very few European birds parasite of other species. It encompasses two special features that have involved it through the millennia in the history of the civilizations with which has been in contact and to which is still linked with various and more updated and elaborated motivations. The common cuckoo is the archetype of the clock, of the time measurement, the changes of seasons, of the start of the agricultural activities, of the awakening from the winter torpor. It is at the same time the identification of the subterfuge, of the malice, of the parasitism, seen rightly that this is the characteristic distinguishing it from any other bird. Not many are the species of birds that have become so familiar and linked with the man as the common cuckoo. Its existence has deeply integrated with the human being and is inextricably linked with his life and his culture. One can sustain without any doubt that the common cuckoo together with the Swallow (Hirundo rustica) and with the House sparrow (Passer domesticus), has set its existence by linking it firmly with that of the man. All populations of the planet know and coexist with these birds, they give a human interpretation to their behaviors, judge them according to their needs sometimes giving themselves justifications more consonant with their point of view than to the reality, they fling it the strangest crimes or the most coveted merits, unconsciously maneuvering it to their own use. A careful observation of the reports and of the interpretations concerning the behavior of the common cuckoo given by the various populations with whom this bird has contacts, however puts in evidence sometimes incomprehensible discrepancies. All the vulgar European names given to the cuckoo, no one excluded, are onomatopoeic, reflect therefore the typical singing emitted by this bird. Also the vast majority of the names given by the populations of Central Asia and even by the Japanese, whose language is so much distant from the other idioms in the continent, follow this scheme. Conversely, there is not a single African or south-east Asian common name or of Oceania repeating the sound. Practically, it is known by everybody in the boreal hemisphere whilst is unknown absolutely in the austral one. 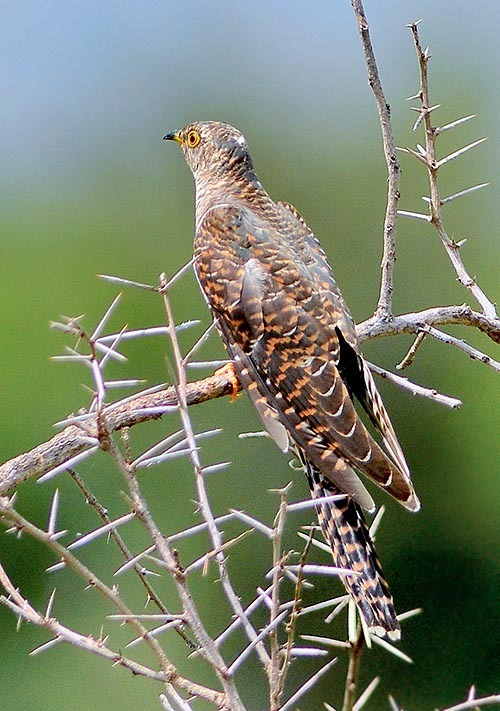 In fact, if you ask to an African what is the song of this bird, he will not be able to reply because over there our common cuckoo is totally mute. In Africa the common cuckoo has not any characteristic such to evidence it from the other birds, indeed often they do not know it at all seen that they mistake it with some congeners that do not have even a significant or well distinct singing. To hear the sweet, warm and rhythmic cucù, cucù, cucù, in our countries, still cool and almost bare of early spring, warms up the souls and gives us a deep relief, as it means having survived the cold winter and being read to live another season. So had to feel our ancestors thousands of years ago! Its singing was considered pythonic, able to predict good and bad fortune. This is when they start to produce proverbs and legends always related to the synchrony of its arrival. “When the cuckoo sings there are things to do for everyone”, was said referring to the works in the fields. “In early April the cuckoo must come, if is not there by the seventh or the eighth he got lost or passed away“, “The cuckoo comes in April, and stays the month of May, sings a song at midsummer, and then goes away. August comes, let’s go! And if in September he is still there, that will such a surprise that even the oldest man will remind it”! The girls counted the number of the beats emitted by its singing, imagining that they would correspond to the years missing to their marriage day. Conversely, the elderlies thought that this number represented the number of the remaining years of their life. In southern Italy the said “Cuccu cuccu di Luritu, quant’anni ci vonnu mo mi maritu?” (cuckoo, how many years for my marriage?) and northwards, in Romagna, they echoed with “Bel cuculo d’aprile, quanti anni ho prima di morire?” (nice April cuckoo, how many years before I die?). “When the cuckoo sings everybody sleeps” repeating the joke of “April sweet sleep”. When it was heard the first time in spring, they had to be in ideal situations otherwise the good omen turned ill. If, when singing, they had pennies in their pockets, that meant sign of wealth and future prosperity, if not, predicted misery only. To see it drinking in a puddle represented the worst possible omen and led to the most atrocious misery. In Scotland they said the to hear the cuckoo while walking in the country was a good omen but on the contrary, was an ill one if heard before breakfast. In Sweden they said that the future was marked by the cardinal point from where the song came. From the north it indicated sufferings, from south the end of an event, from east solace and from west luckiness. In Wales, it was a good omen to hear its song while having the feet on the grass or in the green leaves whilst you would have not lived long enough to hear it the next year if staying on bare and arid soil. Again, in Wales still exists a rhyme, often repeated by the children, that says: when the cuckoo comes with the trees still bare, sell the cow and buy the wheat, but when it arrives during the full blooming, sell the wheat and buy a sheep. In the old times, in Germany, such was the consideration about its puntuality that they took as reference its first song as date for the release of the agricultural lands. It is perhaps inappropriate and not well related the old “as old as the Cuckoo”, more referred to the pre biblical Habakkuk than to our cuckoo. It is still possible to think that it may have been used to indicate again the constancy of its arrival that is so much consolidated to seem old, archaic, perhaps eternal. The cinema too has touched the topic with the movie “One flew over the Cuckoo’s nest” but the reference was purely casual and absolutely not referred to our small bird, seen that it was based only on the word pun coming from the American local lingo “cuckoo’s nest”, the mental hospital. Finally, here are some rather awkward quotations given to this bird. The English term of “cuckold” = to be unfaithful or the French “cocu” = cuckold, or the Italian “fare il cuculo” = to woo others’ woman, or “cuccare“ = to peck at your neighbour’s wife, rightly come from the reproductive behaviour of this bird. Beautiful and indicative is the Friulan saying still in use and probably not even meant in its inmost meaning. When a man, getting married, goes to live in his wife home, they say “lè zuud cuc” = has done the cuckoo. Concluding, a bird loved and detested depending on the moments when it’s met, of good or bad omen when it suits us humans but ultimately, is perhaps the only bird that when missing at the natural call, we invent it and we even take it home, clinging it at a wall disguised as a clock, that emits, every hour, its weird cucù cucù! The ethymology of the scientific name does not need deep explanations. Cuculus is a Latinized onomatopoeic word of its song and canorus due to its melodiousness. Some vulgar European names: in German, Kuckuck; in English, Common cuckoo; in Spanish, Cuco comùn; in French, Coucou gris; in Dutch, Koekoek; in Russian, Kukushka; in Japanese Kakkou and in Italian Cuculo. The cuckoo lives in all continents but in the Americas where is rare and casual and during its long migrations touches inevitably every emerged land, excepting the extreme polar territories. It spends the summer in the boreal emisphere and spends the rest of the year in the austral one. We have talked about its punctuality very similar to that of the swallow even if its arrival is delayed of about 10 days for the temperate areas and of 20 for the northernmost ones. The first days of April coincide with the first sightings and immediately its presence is marked by its unmistakable singing. Taking into account its silence in the winter quarters, we can presume that during the migration its voice suddenly gets back as if the home air should aid it in healing from this seasonal aphonia. In Europe it is the only cuckoo present, but the extreme south of the Iberian Peninsula, where we meet the Great spotted cuckoo (Clamator glandarius) a cuculid that is slowly and locally widening its range in Europe but that has no morphological or vocal relation with our cuckoo. 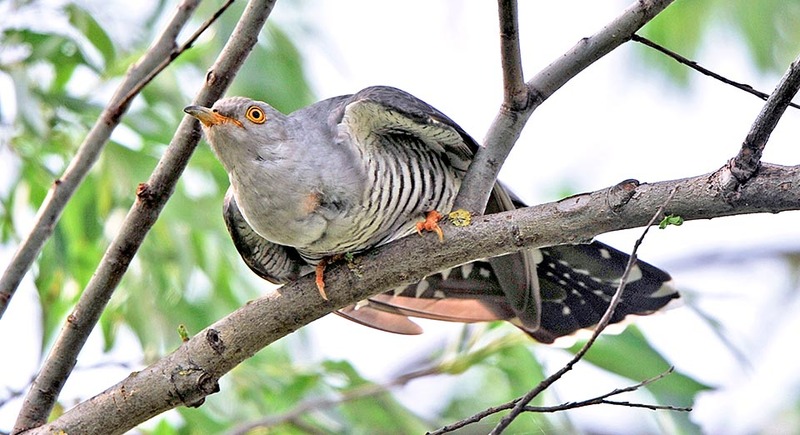 In Asia, the range is shared with the Himalayan cuckoo (Cuculus saturatus) practically the same as the canorus but unable to emit the characteristic singing. 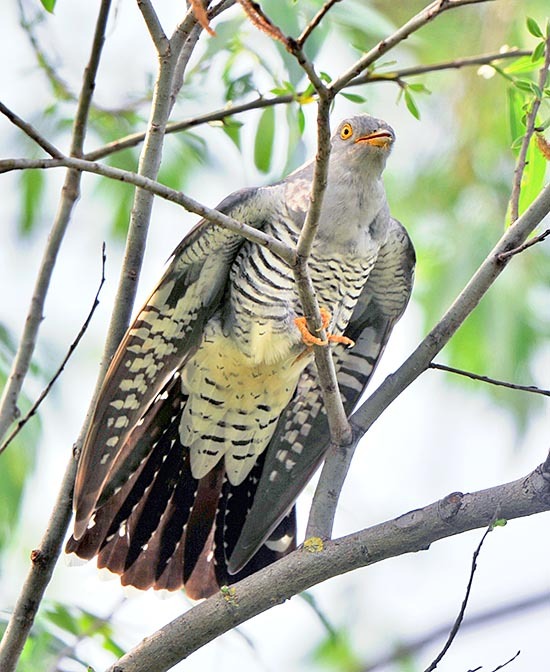 In Africa, numerous is the presence of cuckoos very similar to ours and among which excels the African cuckoo (Cuculus gularis) actually unmistakable from ours if not for the absolute absence of the typical singing. Cuculus canorus canorus, that occupies the belt from England and France up to Siberia and Japan. Cuculus canorus bakeri, western China, Himalaya and northern India. Cuculus canorus bangsi, Spain, Balearic Islands and North Africa. Cuculus canorus subtelephonus, Central Asia, from the Caspian Sea up to Mongolia. 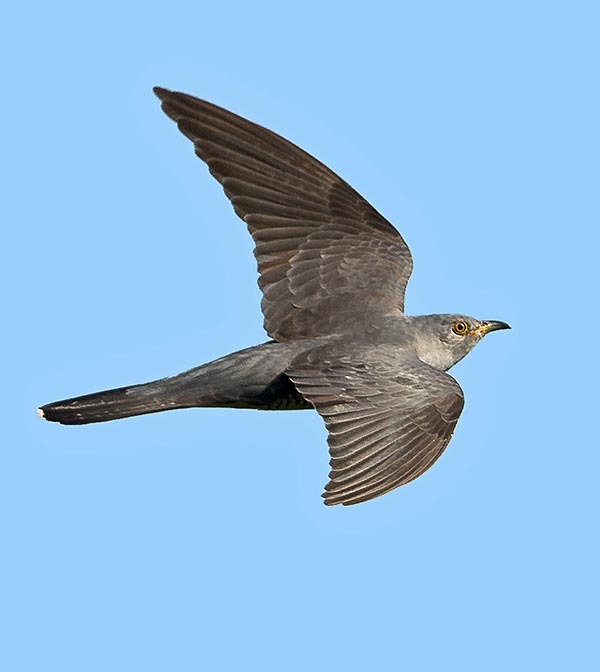 The permanence of the adult cuckoo in the nesting areas is rather short and may limit to only 4 months whilst the young born during the year migrate in the two following months. The parents have by sure a simpler life than the small nestlings as their aim remains only of identifying the nest to parasitize, lay the egg and, completed their familiar planning, to get back to the south. This sudden appearance, this short presence and, as we shall see, the loss of the singing capacity, had originated in the old times the rumours of its transformation into another quite similar bird, the Sparrowhawk (Accipiter nisus). As already told, when talking about the swallow, how Pliny the Elder imagined that the birds who suddenly disappeared out of sight, for the migration to which it did not yet know to give an explanation, became in other seasons different species. The cuckoo was one of them and it was thought that in winter it became a sparrowhawk seen the close resemblance. Still nowadays, in the Veneto region, exists a nice proverb modelled on its message. “D’istà cucheto, d’inverno falcheto” (in summer cuckoo, in winter hawk). 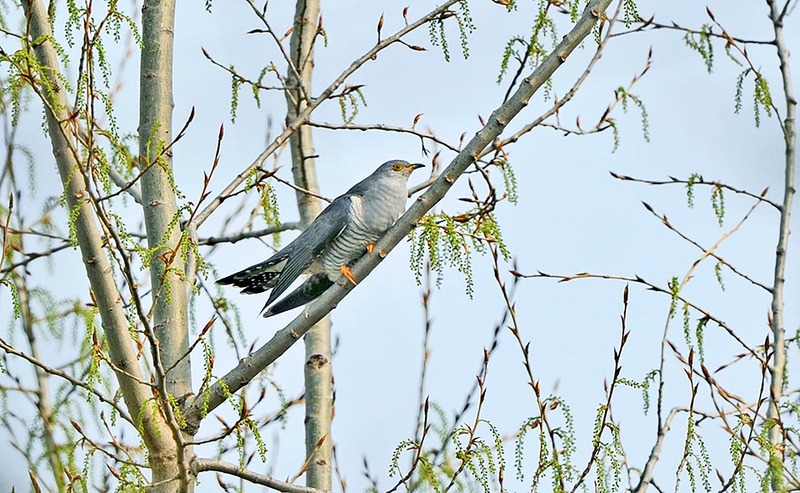 The cuckoo lives in any type of environment, from a grassy wasteland to thick woods, from shrublands to intensive cultivations, from orchards to swamps, from vast reedbeds to slopes of steep mountains, from the coasts of the sea to the continental taiga. Basically, the cuckoo frequents the environment where lives the choice parasitized species, in whose nest will lay the egg that will ensure the continuation of its species. Keeping in mind that they have arrived to count about 100 parasitized species, we may imagine what is the variety of environments chosen for spending this months of opportunism. In the wintering locations, it is equally ubiquitous and does not have any particular requirements even if it prefers arid and pre-desert zones, rich of thorny shrubs and acacias. By means of the last satellite detection techniques applied to some European specimens during the migrations, it has been found that these birds winter in the sub-Saharan belt crossing without any particular difficulty the desert with a direct flight. 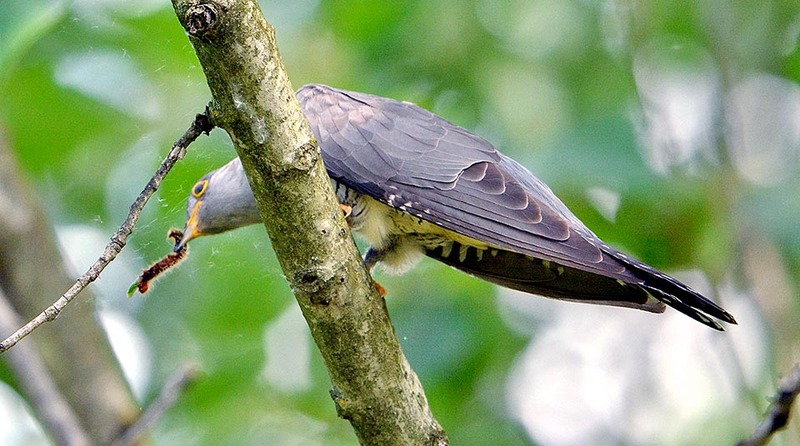 The cuckoo is one of the few birds able to swallow the hairy caterpillars of many species of lepidopterans. In fact, it is probably one of the few foes of those harmful and infesting species which hit our modern agriculture. The Lymantria dispar and the Hyphantria cunea belong to its usual menu. Being a pure insectivore it does not disdain other typologies of insects. 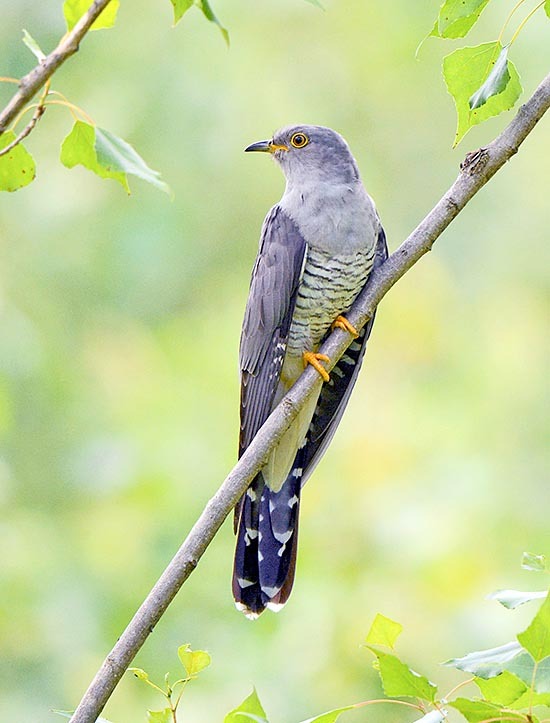 Although such a common bird in the collective imagination and also logically in nature, few know the cuckoo and not many have had the possibility of observing it. This bird has a very shy and reserved life, is very fearful and, most of the times, solitary. It does not love to fly in open spaces if not necessary for displacement and often keeps hidden inside the shrubs and large shady trees from where emits its well known song. It is a good-sized bird seen the its more than 30 cm long, with a weight of 100/150 g and a wigspan of 55 cm. 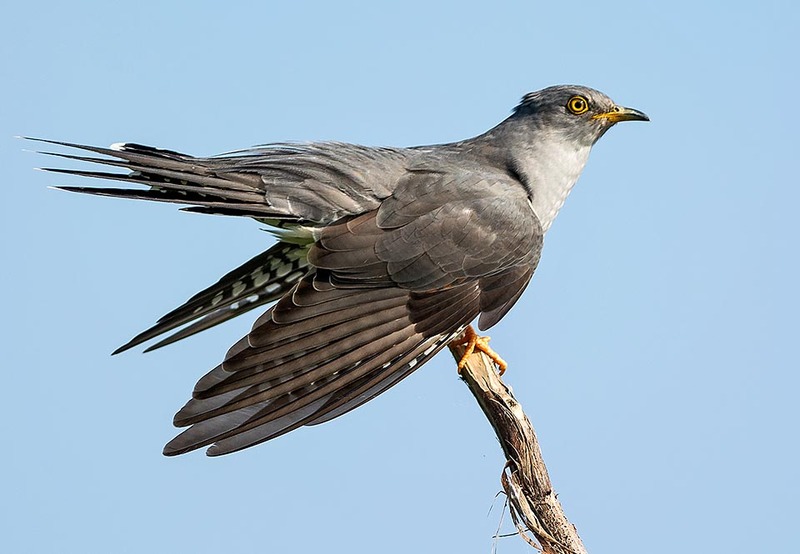 The cuckoo has a very elongated shape due to the prominence of the long tail that makes it look very slender and that while flying seems to unbalance the aerodynamics making it to lean forward as for sustaining its weight. The wings are very pointed with a very rigid beat as it would be using only the points. The plumage is given by various colourations of grey, with an alar cover of light bluish slate colour, the head and the neck are ash grey and the chest is white crossed by black transversal lines. The eyes are yellow surrounded by ocular ring of the same colour. The beak is short, always greyish and slighly bent on the tip. The paws are of reddish flesh coloured with zygodactylous fingers. The fan-like tail is regularly spotted by white patches, well visible when wide open while singing. The female can have the same colours although a reddish form does exist where the whole shade of grey is replaced by an ocher brown one. The young are quite similar to the adults but are easy to identify thanks to the much more variegated livery and to the different period of presence. Hindsight, a description corresponding by the 90% to that of a sparrowhawk with whom it is easily confused also while flying. It seems that this characteristic, especially for the subjects with grey livery, is determinant for the success of the parasitism, as more similar to the raptor seems the subject, the easier is the approach to the nest to parasitize due to the temporary escaping of the unwitting victim. We said already quite a lot about the singing of the cuckoo but it is necessary to study in deep some not always known characteristics. The song of the cuckoo can be heard only in the summer quarters, as soon as it gets to the boreal hemisphere and its characteristics persist up to the month of May and the first half of June. Identifying is in this period the usual “cucù cucù”, emitted by male only when sexually excited and when defending the occupied territory. As a matter of fact, the female answers to this song with gurgling and squeak sounds. By mid-June its song modifies in “cucc-cucù” and after a very few weeks it becomes silent up to the following year. For being a parasite it is customarily necessary to have skills superior to the parasitized subject. Tricks and stratagems out of the normal must be implemented, it is necessary to exploit one’s own capacities and on the contrary to take advantage of the others’ weaknesses. The cuckoo is a shrewd and clever bird, observer and recognizer of the species and of the habitat where it lives. It has a visual memory definitely out of the ordinary and knows how to exploit it by observing carefully every move and behaviour of the subject it intends to parasitize. It is not known exactly how it gets to find the nest of the subject future victim but it is sure that it observes every single behaviour and determines if this is in phase of spawning, studies the timings of its movements, decides when it’s the ideal time for taking advantage of them, starting of course from the identification of the species necessary for its choice. They have been able to identify a hundred of parasitized species even if only few of them are since ever the most affected and give with certainty the wanted results. Compulsorily, they are insectivorous bird like the cuckoo, therefore besides the shrewdness of the choice, they must know a little about zoology ! They are usually small insectivores, such as meadow pipits, redstarts and reed warblers but also wrens with absolutely extraordinary differences in size. Usually, the egg is very similar to those present in the nest, so much to mistake at times also the human eye, however it does not seem that even clear diversities may cause refusal reactions by the parasitized subject. It is evident the case of the Dunnock (Prunella modularis) that has bright light blue eggs whilst the egg laid by the cuckoo is always of pale colour spotted of ochre. The cuckoo lays during each season about 15 eggs, of course leaving only one in each nest. 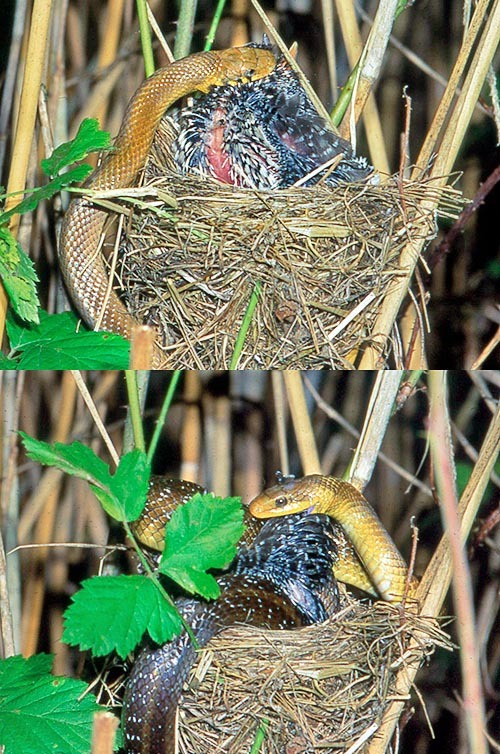 Once identified the nest, it begins to perform the task in a very fast way. In a very few seconds it lays its eggs and takes off, usually throwing out from the nest one of those already present and then goes immediately away. Usually the visit is not observed by the attacked but the whole operation is so fast and sudden that even if observed, it may be interpreted by the parasitized subject like the passage of an odd falconet that, after all, has done nothing of particular. 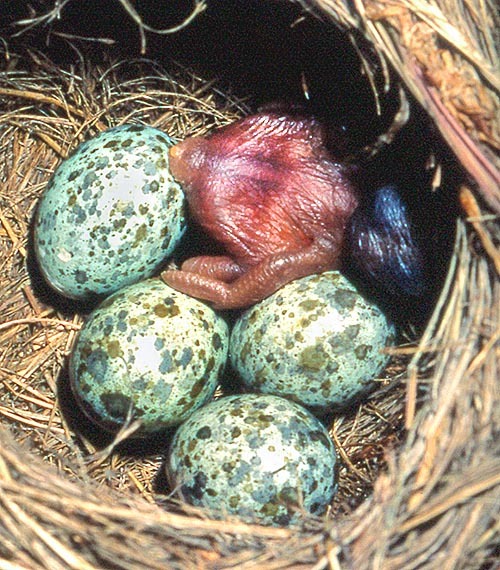 The cuckoo’s egg has very reduced size if compared to its size and has a period of hatching well under that of those of the parasitized birds. The egg usually hatches after 12 days. At birth the nature carries out its course with a hardness and security that has given in the millennia the guarantee of prosecution of the species to these birds. The featherless chick is equipped with a slight depression on the back that allows it to support and push out of the nest the present eggs and that are not yet open. A huge effort for a creature often smaller than the eggs it must expel, repeated many times till when all of them are thrown out. A natural, instinctive and ancestral operation done, eyese closed, beginning almost immediately after the hatching. In this way the young cuckoo ensures its florid and selfish future ! The small cuckoo in the nest looks like a hungry dragon, insatiable, insistent at every moment, never satisfied of what has gotten and always keen to receive more. The immense mouth, of a bright red, frightening when wide open, is a continuous allurement for the terrified parents. A well that becomes so large that the head of the foster parent disappears while nourishing it and into which disappear every species of insect, of any size and colour. It swallows everything, like a living sink. The rapidity of growth of the cuckoo is unbelievable. It comes to life with a weight of about 4 g and can weigh more than 120 g in 20 days of time. Often the parents, whan the young is so great not to stay longer in the nest, use to feed the “chick” perched on its back or even leaning on its head. A monster found suddenly in the nest and to whom anyway pour all the love they would have given to the numerous natural brood. By sure the cuckoo is not appreciative of this love and in fact as soon as independent leaves shamelessly the foster parents and begins its autonomous activity. 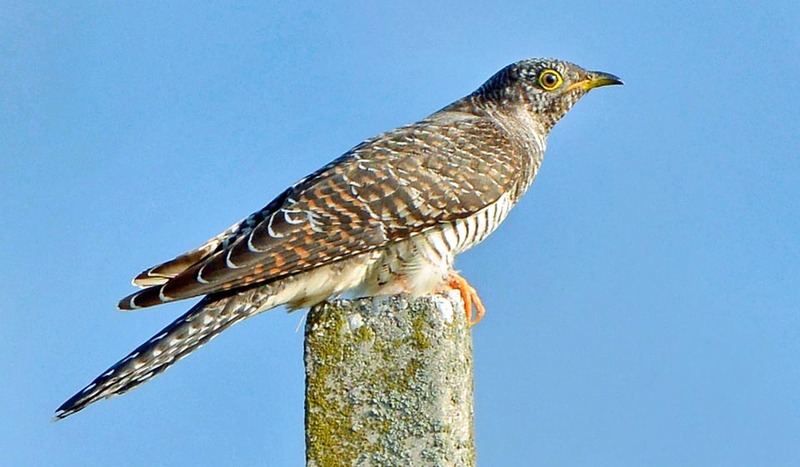 Easy to say but not easy to understand how can the young cuckoo as soon as flown off and without any geographic experience, undertake the migration journey to the warm countries. The “really reckless” parents, seen that after having laid the eggs have abandoned the area and are comfortably getting back to the winter quarters, will not be their guide and will not be able to teach them what in turn their parents have not taught them. The cuckoo is a migrant usually solitary and faces an incredible journey of thousands of kilometres towards a place that noboy has shown it but that will lead it exactly where unconsciously wants to go. Facts difficult to explain to us humans, when currently we are losing even the slightest feeling of that primordial instinct that has always guided us. The species is not endangered seen the great number of specimens present in the area and the good rate of annual reproduction.